Children under 3 do not need a ticket. Limit 1 free group photo per group & 1 baby gator group photo per group. Get up close and personal with some of the most interesting and exciting wildlife! 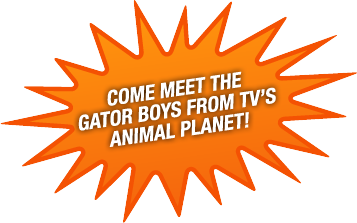 NOTE: Please call 954-434-8113 to schedule your Animal Encounter 24-hours in advance after you purchase your ticket(s). 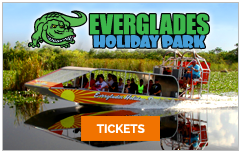 Does not include Airboat Tour, Alligator Presentation & free group photo. Children 11 and under must be accompanied by an adult. Must purchase 2 or more tickets. Beat the lines at the park by ordering now! Get your tee shirts now at a discount, and pick them up at the park! Shirts and sizes (adult sizes only) to be chosen upon pick up at the park. Cannot be exchanged for other items. Certian exclusions apply. In the case of lost tickets, you may need to use this credit card to verify purchase. 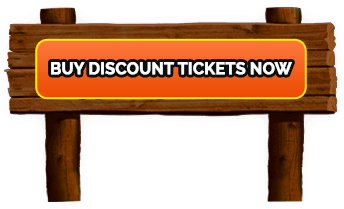 Please enter an accessible email address to send your tickets for print or mobile. A Travel Must: Florida Everglades Tours Have You Considered a Florida Airboat Ride? Top Picks for Family Travel: The Florida Everglades Must See Animal Attractions In Fort Lauderdale Things to Do With Kids In Fort Lauderdale The Best Family Adventure In South Florida Everglades Restoration: Floridians Have Spoken, Can We Count On the Help? Everglades Airboat Tours: Why We Love Them 9 Signs You Should Visit the Everglades Exploring the Everglades - Wading Birds In Decline? Meet the Coolest Reptile in South Florida - the Alligator Top 3 Activities In the Florida Everglades Lacking Creativity? Three Ways to Explore Your Inner Artist Why Is Protecting the Florida Everglades So Important? Are There Really Alligators In New York City Sewers?